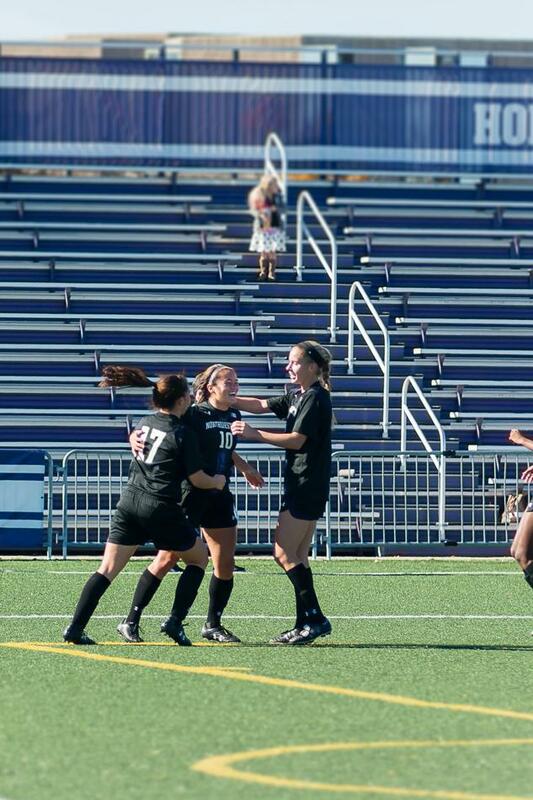 Sophomore midfielder Maria Grygleski celebrates with her teammates after scoring her first goal of the season. The Wildcats’ offense has found its rhythm recently, scoring four times in the past three games. With just one game remaining in the season, the Wildcats find themselves in unfamiliar — but pleasant — territory. A win Friday against Minnesota would not only put the team above .500 to end the regular season for the first time in six years, but it would also give them a shot at the Big Ten Tournament. The Cats are sure to be watching Thursday when conference juggernaut No. 6 Penn State takes on Maryland. The Terrapins currently sit in the eighth and final spot of the Big Ten Tournament bracket with 14 points, after losing to Wisconsin 1-0 in double overtime last Sunday. The scenarios are aplenty; a Maryland win or an NU loss/tie eliminates the Cats, regardless of other results. However, a Terrapin loss coupled with a Cats win would put NU in the eighth spot and on its way to West Lafayette for the Big Ten Tournament. In the event that Maryland ties Thursday and NU wins, the teams would both finish the season with 15 points. The Cats would have more conference wins, however, putting them in the eighth spot. Regardless of the final standings, NU fans can be happy with the progress the team has made under coach Michael Moynihan. The Cats have been competitive against opponents all season, beating three nationally ranked teams. Every loss the team has suffered has been within two goals except for a 4-1 loss against the Nittany Lions. NU has a +4 goal differential with just one game left in the season. The team has not posted a positive goal differential since the 2007 season. Besides the team’s record, stellar play from underclassmen, including freshman goalie Lauren Clem and sophomore forward Addie Steiner, is also a good sign for future years. Clem said she’s taken a lot away from this season mentally, and is hoping it takes her far this year and in the future. With a little help from the Nittany Lions and a win Friday, the Cats can find out.